No matter where you found yourself at the end of 2017, we can all find ourselves feeling hopeful as the new year begins and we start to plan our hopes and dreams out for the coming months of 2018. These are all words that circle around during the transition from one year's calendar to the next, and they are all good and inspiring words that make us believe that we will be better... that we will DO better in the months to come. The unfortunate reality is that many of us continue to fall victim to the temptation of "tomorrow" and "later" and "next time" EVEN when we have this INCREDIBLE OPPORTUNITY FOR A FRESH START! SO.... Let's put an end to the cycle of procrastination once and for all and GET THOSE GOALS ON PAPER AND PLANNED OUT! ... But where do we start?! 1. Start by discovering the feelings you want to create in your life- Having a goal to lose weight, make more money, have a better relationship with your spouse are all good and well on their own... but understanding the feelings and the reasons BEHIND those goals is what makes them come alive and makes them inspiring to you for the long haul. 2. Keep it simple- Instead of making a list of 10 things that you want to improve upon this year, pick 1-3 main goals that, if you can make consistent positive progress, will move your life in the direction you desire. A large milestone like a new year can help us see all the places in which we have fallen short in the past and all the areas we hope to move forward with in the future... but biting off more than we can chew is a surefire path to failure. 3. Identify positive actions that you can take that WILL move you toward your end goal- These should be measurable, trackable, and reasonable. Remember that small actions every day add up to BIG results. Chances are, you KNOW what you need to be doing to move yourself in the direction of your goals... you just haven't put pen to paper and made a PLAN for it before! 4. 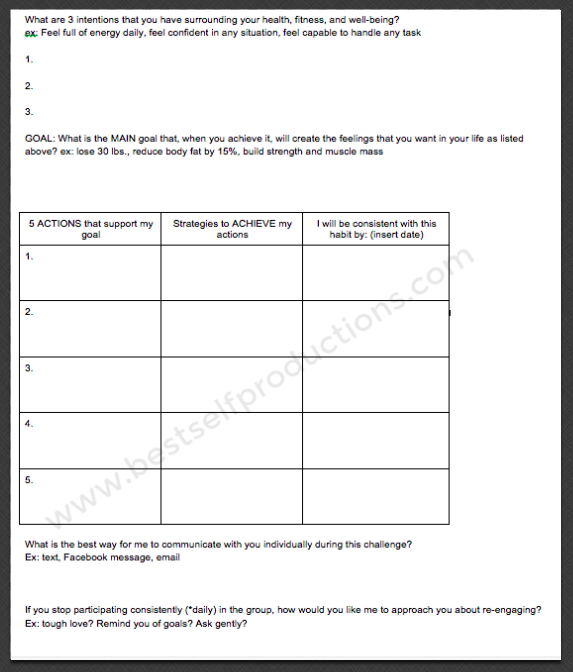 Set up an accountability system- Find another person or a group of people who you can be held accountable to when it comes to sticking to your goals! This is THE MOST IMPORTANT PIECE of the success puzzle in ANY area of life! We are social creatures, we succumb to peer pressure, and we want to live up to others' expectations of us... USE THIS TO YOUR ADVANTAGE! TRICK YOURSELF into succeeding by sharing your goals with people that you know will support you and challenge you along the way! ...Not quite sure how to apply these ideas to YOUR goals???? Below you will find the PHASE 1 Goal Setting Sheet that I help my clients complete at the beginning of their health and wellness journey with me. There are 2 groups coming up in January to support those of us who are reaching for health and fitness goals in the new year! Option #1 is The JANUARY JUMPSTART group that will be focused on detoxing after the holiday season and getting us on track for a healthful 2018! We will be working out, eliminating the most inflammatory foods from our systems, and supporting one another in our goals along the way! Option #2 is the TEST GROUP for our newest program, 80 Day Obsession! This program is for the more experienced exerciser who is ready to take their fitness to the NEXT LEVEL in 2018 with a fully periodized workout program paired with timed nutrition to get your BEST RESULTS EVER! Wherever the New Year takes you, I hope it's beautiful!